...this ring by Alex Monroe. It was a gift from the Stickman last Christmas and, rediscovering it the other day, I realised I should be blogging about my bargains past, as well as present. After all, more often than not, there's a thrifty story behind each find. This particular gem was bought at the Pullens Yards open studios event last December, where artisans and craftsmen in this historic pocket of south-east London open up their doors to sell their wares. And, it just so happens that one of my favourite jewellery designers, Alex Monroe, has his studio in SE17. I love his delicate silver and gold designs, inspired by nature, so I was like a child in a sweet shop browsing through his samples and old-season stock, alongside his main collections. 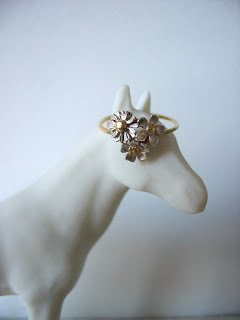 This dainty little ring was £40 - a fraction of what it would retail for in the shops. Mind you, based on cost per wear, it's easy to justify one of Alex's exquisite pieces... well, that's what I'll be telling the Stickman next time! I'll keep you posted about the next Pullens Yards open studios event but, meanwhile, do check out Alex's designs. They're a timeless investment and that's what good quality jewellery is all about. Plus, his sneak preview of his spring/summer 2010 collection looks very exciting! Oh, and Sienna Miller's been sporting his creations Stateside while promoting her new film, G.I. Joe, adding to Alex's legion of A-list fans.